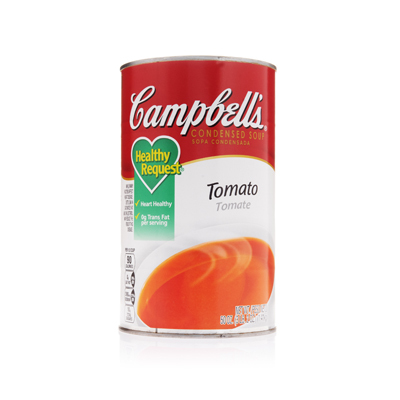 A combined dish of peppers, onion, rice and ground beef made with Campbell's® Healthy Request® Condensed Tomato Soup. Flavors of Worcestershire and hot pepper will add spice to any menu. 85% lean ground beef	 5 lb. 1. 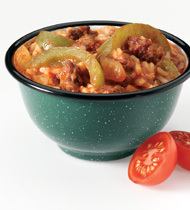 Cook beef, green peppers and onions in skillet until beef is browned, stirring to separate meat. Pour off fat. hot pepper sauce	 3 tsp. 2. Add soup, water, Worcestershire, garlic powder, cumin, hot pepper sauce and black pepper. Heat to a boil. 3. Stir in rice. Cover and set aside 5 min and internal temperature is 165ºF or higher for 15 seconds. Fluff with fork.